Family Friendly half duplex boasting modern open concept living/dining rooms, a family sized kitchen with natural gas range & nook perfect as a computer space or homework area. Roughed in for gas fireplaces up/down. The large Master Bedroom features a full 4-Pc Ensuite. Enjoy morning coffee on the sunny front balcony & family barbeque dinners in the sunny backyard. Bring your imagination! The full light, ground floor level is mostly unfinished, framed for 2 bedrooms & roughed-in 4-pc bath. Potential for home office or 5 bedroom, 3 bath home with family room & back patio. 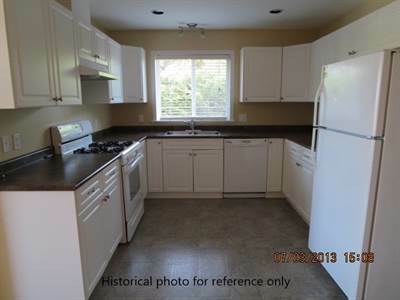 Appliances included (natural gas hot water). Single car garage plus extra driveway parking allows for RV parking. Families will appreciate the culdesac location & close proximity to many recreational facilities such as golf, soccer, curling, baseball, playgrounds & hiking trails. Convenient to transit, schools & shopping. Sqft is from the registered strata plan. Buyers must independently verify all information.